My automatic shifter is loose from side-to-side. 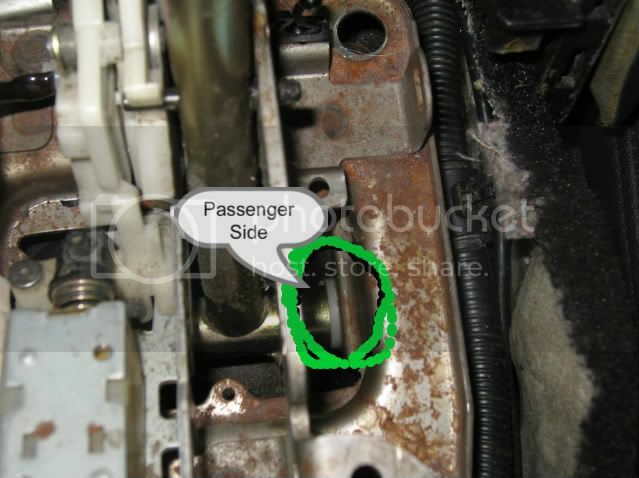 Curt from Elmhurst sent me a diagram showing two bushings that could be the culprit. Replacing them looks very tedious as many cables/connectors, etc are in the way of removing the shifter assembly and console. 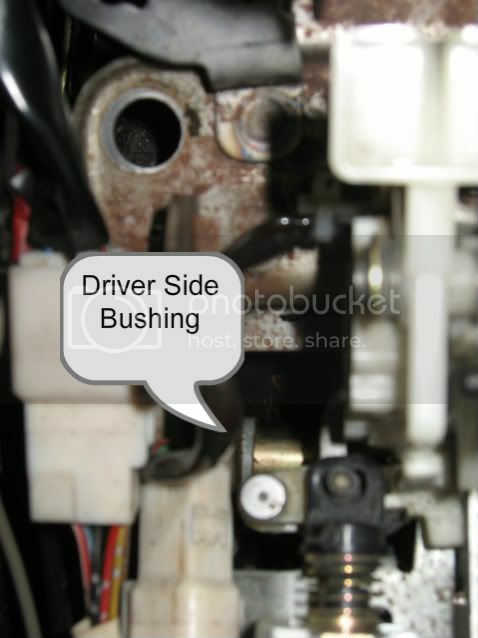 Anyone had any luck with tightening up a loose auto shifter by replacing the bushings? I have a complete auto shifter if you got a pic of the bushings I can check and see how hard it would be to replace. Al, when I did my manual conversion I recall it being very easy to remove the shifter assembly, the only tricky bolt to get to was the one you have to loosen from the bottom onto the trans. 1991 MKIII Toyota Supra 1JZ, the "official" FFIM MKIII- Officially stolen. 1994 MKIV Toyota Supra Single T70, Fuel, MAP ECU, RPS 6 puck................Sold. When I put 7M in the search it only came up with blown head gasket threads. "There is so much good in the worst of us, And so much bad in the best of us. That it behooves all of us Not to talk about the rest of us." I cant attach the pic, but they go on each side of the T shaped metal tube at the bottom (the pivot point for the shifter). Not sure what holds them in place. I can e-mail you the pic if needed. Gotcha, I'll check it out and report back. how much for the full auto shifter? pics? Well looked at it, don't seem too hard. You take the whole assembly out, 4 screws 3 plugs and a little eclip or what not underneath the car. 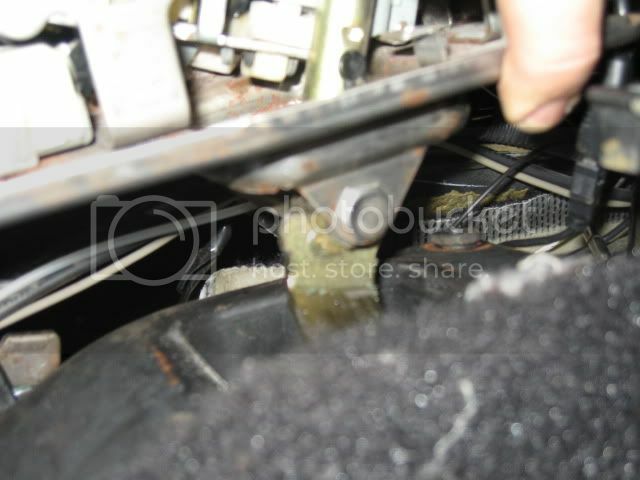 Then you remove the rubber boot, shifter knob, and the bolt that the boot is covering and should be able to get it out. But depending on the price of the bushings might be cheaper to just find a nice used assembly. What did you find out with this? Mine has alot of side to side slop that I dont remember it having before and I would like to fix it if possible. He said that is the only part that seems to wear out. They are pretty flimsy plastic. He also sent an exploded view of the shifter, which is nice since that is one complicated component with all the switches, wires, etc you have to remove to get it out. I have no idea where that harness plugs in that keeps you from pulling the console all the way out. Have not installed them yet. I am waiting to do it while the car is down for other work. Is this something that could be machined from a billet piece that would eliminate the need for replacement ever again? Send me that pdf to [email protected] if you dont mind Al. I have the same sloppy shifter issue and if you come up with a billet or polyurethane piece I'm in for a buy. The bushings are a very thin plastic-like material. They might need to be plastic for the whole unit to snap in place, cause there appears to be no bolts to tighten to install them. Anyone install new bushings yet? I am working my way down in there, just looking for any tips to make it easier. About to cut the console in half so I can remove it completely despite the cable Toyota loops over the center mount so you cant get the console all the way out, fuckers!. Not yet Al, I am going to start on my interior soon and I will look and see what the deal is. I have noticed that the shifter is alot looser in 1,2,D than it is in R,P,N is yours the same? I didnt notice which gears were worse, just that the last time I drove the car it was really bad. I am going to remove the whole shifter unit, taking off only the wires necessary (of which there are many!) The bolt/bushings look like they are below the mounting plate. I finally took the shifter out, the bushings were gone except for a few crumbs! The bolt that holds them in is under the mounting plate, have to remove the rubber cover. To get the thing off, start by completely removing the console (I had to cut mine b/c of cable over the center mount). Then, unhook all the wires, and pop off the zip tie wire mounts, and take the whole shifter unit out with the plastic covers for PRND21 and everything else intact. Dont have to take the shift knob or anything else apart. After putting some grease on the bushings and installing, the is no play whatsoever. I doubt you could make them out of alum, they are very thin. Nice Al! I will take a look at them when I get the shifter out. I can probably make them out of aluminum shim material if they are that thin. You didnt happen to take any pictures did you? I still have the shifter out of the car, but you cant really see anything. You will need to get factory bushings to model alum bushings after. I think they are too thin to make out of alum (1/32" in one direction, 1/16" on the side). You would be fine with just new factory ones since the first set lasted 17 years and 90k miles! They are only $3. Funny that I found this today... as I spent one of my days off this week jacking with *my* shifter (A '98 with 147K miles it just went loose overnight it seems) I was already in there and had things torn apart to install a new overdrive switch...so I wanted to get to the bottom of the recent loosening of the shifter. 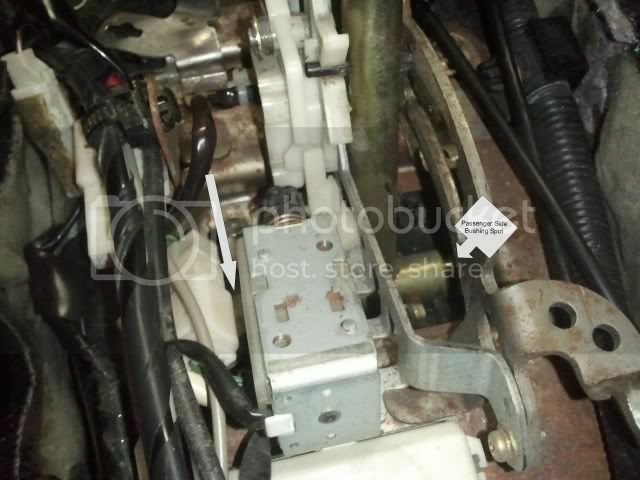 Can you look at the pics and tell me if this is the same location where you put your bushings? Then I simply "press fit" them into place. vs pulling down the rubber boot to get at the retaining bolt and taking the whole thing apart. Label View. I'll try and grab some pics tonight so you can see one of the home grown nylon bushings. Last edited by yibuy4n; 08-25-2011 at 04:52 PM. You didn't have to cut anything! A serious pain in the rear yes, but you just have to unclip the overdrive and gear selector light connector. Although it is a B-Effin' .. Mine had a huge cable that ran from under the carpet up over the console then under the dash that prevents the console from coming all the way out. I would rather cut the console than take the dash panel off again! I will reinforce it good as new. I cant see PB pics at work. I dont see how you can put spacers in w/o taking the bolt out, unless they are "half moon". The bushings are $3 each, just do it the right way! Yep. I pulled the bolt last night, got a few larger i.d. nylon bushings...trimmed them down to slightly thicker than 1/32 and slipped them on the inner collar that runs through the base of the gear selector then bolted it all up nice and snug. BTW if the bushings are too thick you won't be able to get the assembly back together! Just did this today MAN what a difference in the shifter feel! Before it was had 1/8" of "slop" in it, now it is solid as a rock. Very worth the $5 for both bushings. To do this, follow the directions Al stated. VERY easy to replace. Glad this thread popped up since I've been wondering if it was just my shifter that was sloppy. I'll be ordering the bushings Mon. from Curt. Removed & dyed my carpet this week & waiting on rear speakers to come in so may as well do this now before I put everything back together. Great timing on this thread!